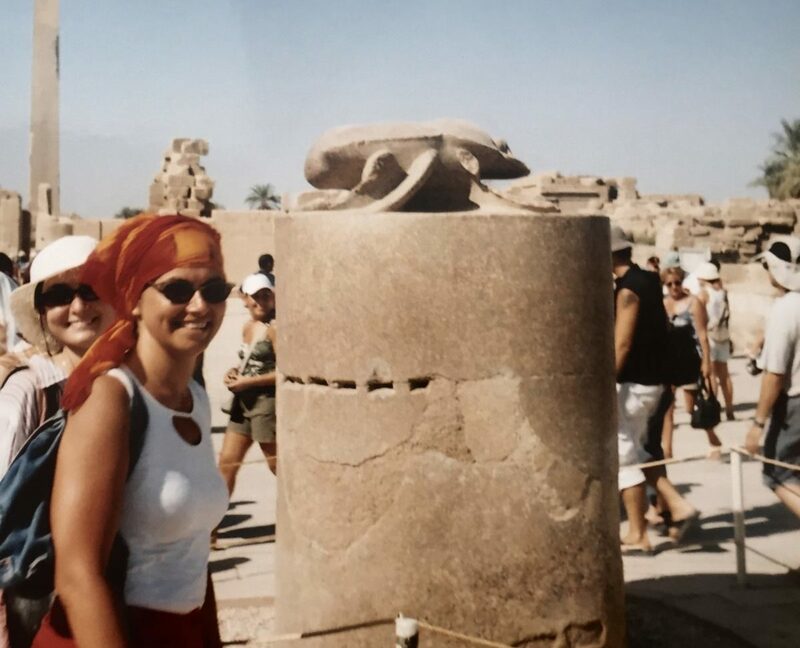 The very first time I saw Karnak, Egypt was in August, 2005. Then I had no idea August is a monstrous month for visiting the Egyptian desert. But upon my arrival, it was immediately revealed. 50 degree Celsius at 2 pm, dust everywhere, no shades available and the sand was burning under the feet. But guess what? I loved it. Karnak is the most mysterious spot you could picture in Egypt. It’s massive, all coloured in my favourite ochre nuance, stands proudly tall in the middle of nowhere, whispering a tale as old as time. We already spoke about the fact I adore deserts (for some unknown to me reason so far) and am a huge heat admirer as well. 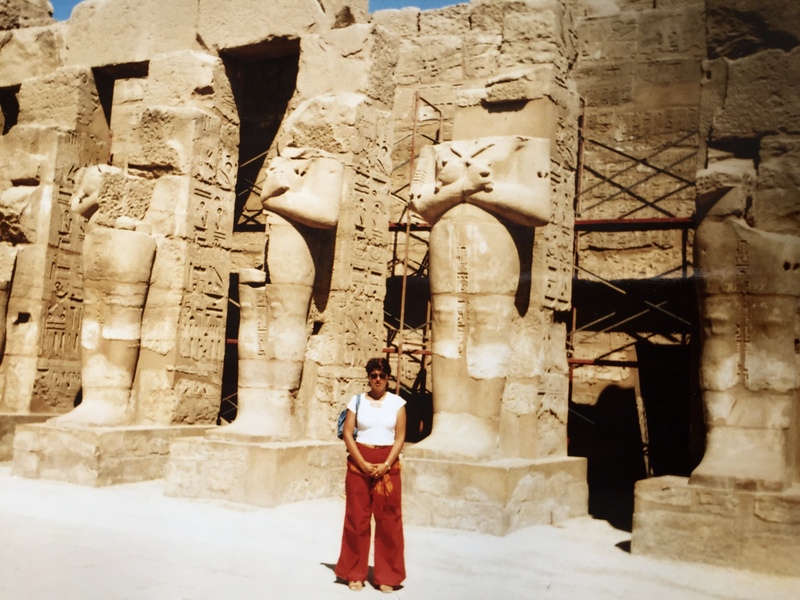 Those both, plus some extra unexpected discoveries, made my journey to Karnak unforgettable. 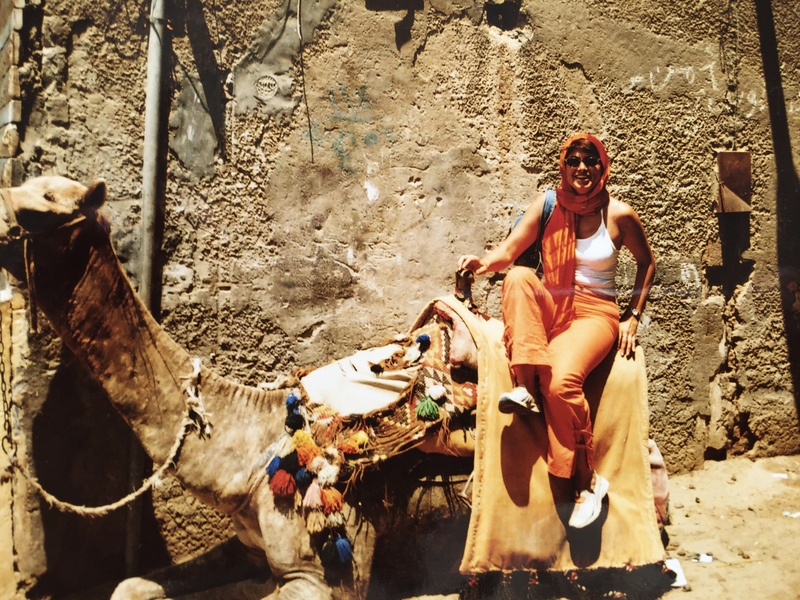 After the pyramids and the Sphinx in Cairo, the visitor assumes there is nothing more remarkable to blow their mind away or to leave them speechless. But Karnak was the ancient complex that actually took my breath away and surprisingly taught me humility. Just imagine a colossal complex of oversized buildings, thrown in the heart of the desert, that looks alike with nothing from our world. Everything is so beyond the ordinary, that I felt dizzy and had no idea where exactly I am. Let me firstly provide some statistics, which will probably give you a vague idea about the scale of extraordinarity of Karnak. 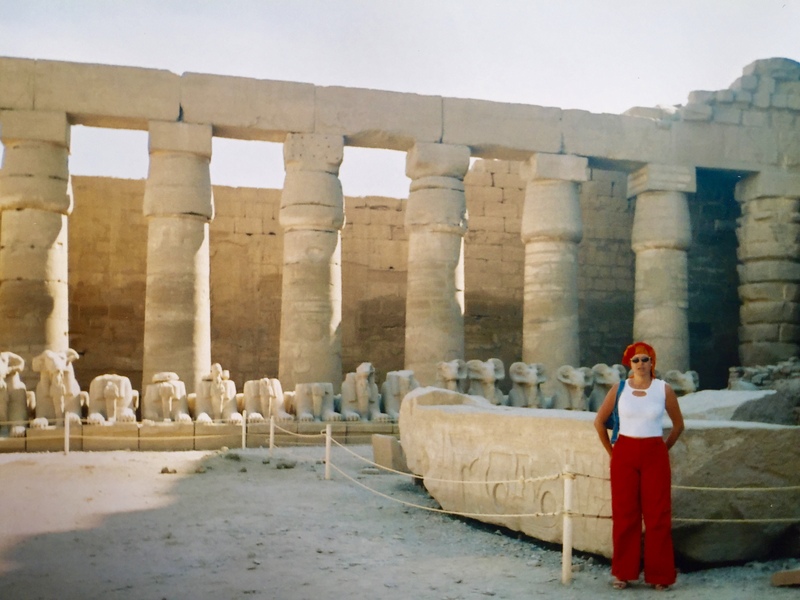 It’s the biggest palace complex in Egypt, about 3 km away from the famous town of Luxor. What remained nowadays is 134 massive columns, built by sandstone, lots of gigantic statues, chapels and some colonnades, part of the main palace. The columns are between 10 – 12 meters tall, with about 3 meters in diameter. Each of them dozens of tons weight. The material they were built from, traveled 150 km to reach Karnak. The sandstone was transferred from an ancient mine in the South of Egypt, called Gebel El Silsila, near Nile river. I can’t even imagine what kind of engineering mind projected and built it, achieving the balance between gigantic height and weight. It’s truly massive. 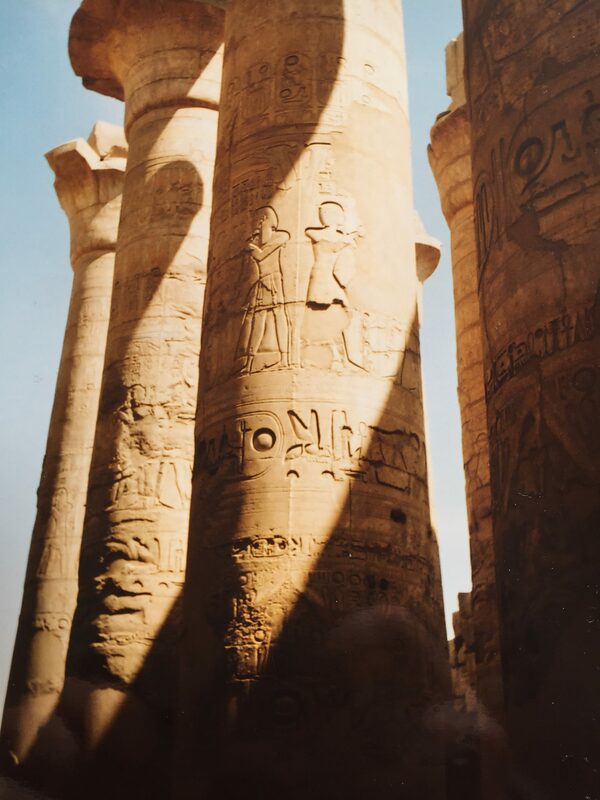 And all the columns are covered by carvings, sharing stories, Egyptian gods acts or simply documenting ancient events. At the time the columns were erected, all the carvings were painted in different shiny colours, but nowadays there are just bare remains of green and red colour, visible deep in the figures. I saw only the carvings on the level of my eyes. No doubt, they were a master piece of art, elegant and professionally cut into the sandstone. Being among that great expression of technique, imagination and talent, made me feel small and insignificant, with no trace of my usual pride of modern, progressive and advanced human being. Built 4000 years ago and evolved with every next dynasty, Karnak is a stunning documentary of dynamic and sophisticated life. At the entrance of Karnak’s complex, still stand two gigantic statues, popular as colossi of Memnon. That’s a beautiful myth and I really like it. Memnon, a hero from the Trojan war and king of Ethiopia, was named to be a son of the dawn goddess – Eos. Many witnesses reported the Northern statue is gifted – “crying” at the time of dawn. Not sure if “crying” is the correct word, but everyone describes the noise, made by the Northern colossus, in different ways. After a strong earthquake 2000 years ago, the statue was partially destroyed and cracked, so since 20 centuries the colossus of Memnon was heard to sing, cry, scream, whisper, blow or just to make an inexplicable sound, always at sunrise. As you know, I love legends and myths. I also believe in the proverb:”There is no smoke with no fire”. So, must be something in there. Eventually, this crying/singing ability, built an outstanding reputation for the colossi of possessing oracular powers. Several Roman emperors traveled to particularly visit the statues and to “soak” their legendary power. I was there (three times), but unfortunately never at sunrise, so can’t confirm of hearing anything epic. 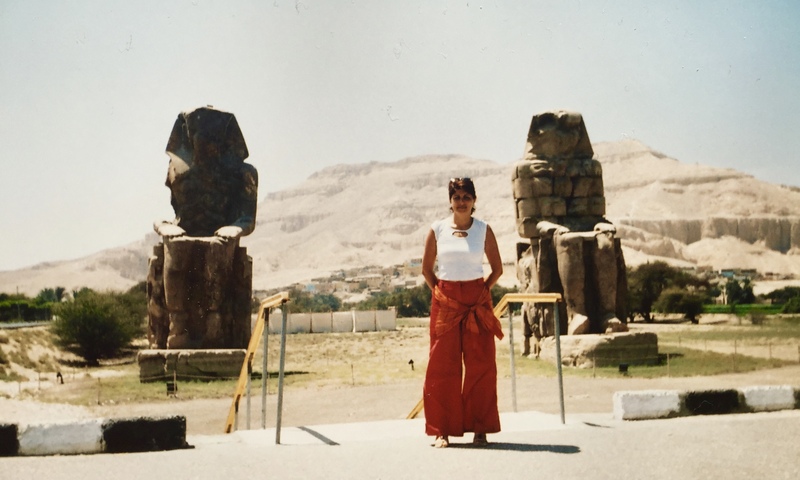 But hopefully, standing between the statues, I have absorbed kind of a magical power…always depends on the faith. My favourite attraction in Karnak, was the sandstone scarab in the heart of the complex. The scarab beetle was worshipped by the ancient Egyptians. It also became a popular amulet, symbolising rebirth and regeneration. I was told the Egyptian god Khepri was often depicted as a scarab beetle or as a scarab beetle-headed man. Khepri’s responsibility is to make the effort to renew the sun every day, before rolling it beyond horizon. Then carried it through the other world after sunset, only to renew it again the next day. This way, having incredible power, the scarab was easily recognised as the favourite amulet of the ancient Egyptians, providing strength and protecting them. Here comes my story from the picture below. The sandstone scarab in Karnak is believed to keep and provide limitless power. No one can say if it’s just a funny trick to attract tourists or an ancient belief, but still works well. Hundreds of tourists could be seen daily, circling around the Karnak scarab. The legend tells, if you complete four tours around the scarab, you would be gifted by entire life health. Six circles are for money, seven – for prosperity, nine – for having a baby. Sounds to me a bit dangerous. Everyone must be careful, while counting the tours. In case of a wrong number, could get unexpected baby instead of prosperity… The next two times I have visited Karnak, the number of tours varied, depending on the guide personality and their preferences, so I am not really convinced how it works. Also it’s not clear, if six circles for money were completed, does it include those four for health? Anyway, it’s a funny ritual, everyone enjoys it, hoping to get some extras. That sandstone scarab must has already delivered plenty of babies, money and prosperity, because millions are touring the holy figure all year round. We are almost at the end of Karnak tour and about to go out of the complex. What’s a real pity we can see the shape of the complex, but nothing from the ancient interior. The hypotheses assume the furniture inside was mostly wooden. Also sandstone statues and figures, surrounded by fine accessories, crafted from alabaster. I can’t skip the alabaster moment, because it’s sort of important sightseeing in here. Currently, alabaster industry is an attraction and a well controlled business, generating lots of money. 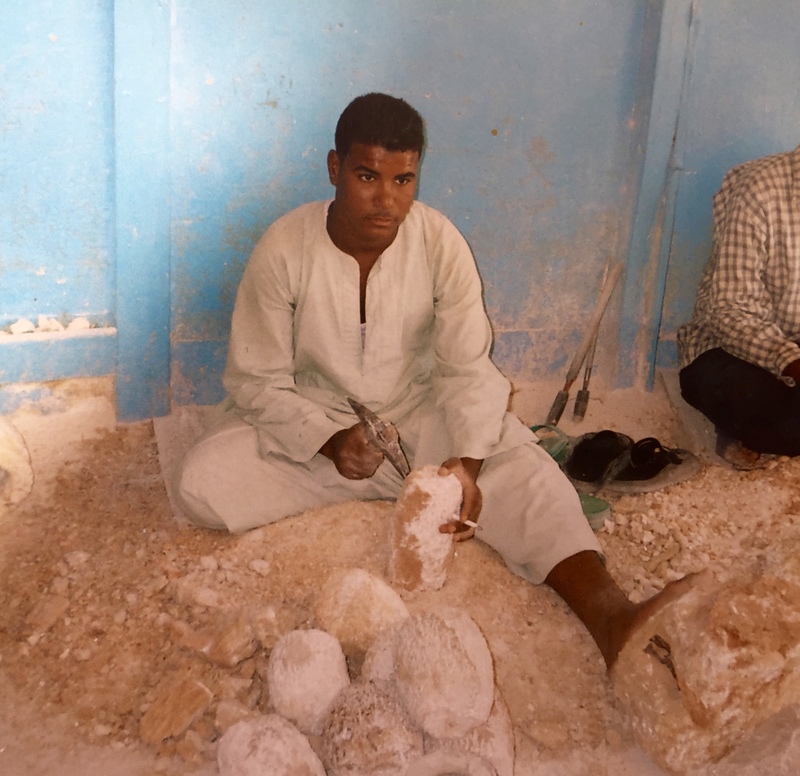 Every corner around hosts an alabaster work shop, a fine stone material, mined in diameter of 40 kilometres around Karnak. The process could be observed in those work shops, from the rough treatment of the stone pieces, right in front of the store door, to the nearly jewelry elegant final products. Everything is handmade, as the alabaster is too fragile and won’t be able to bear a manufactory process, involving machines. 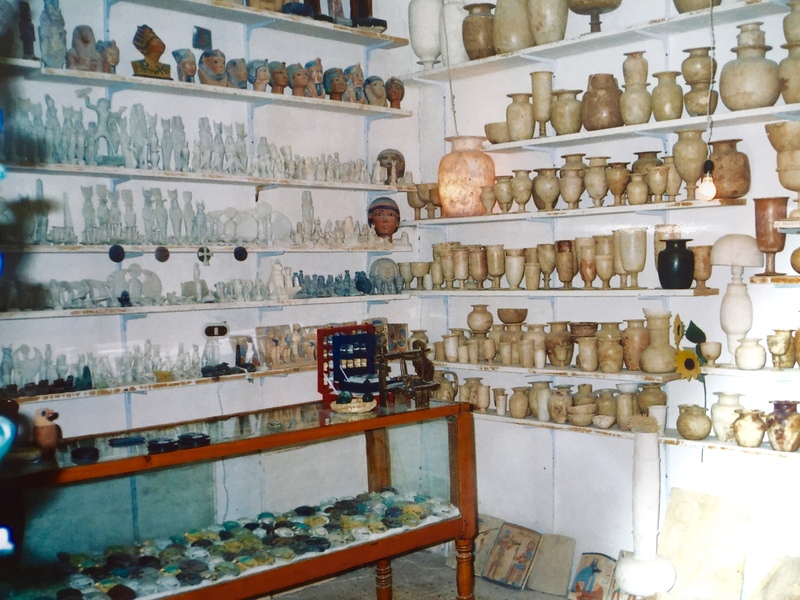 Scarab amulets, vases, cups, glasses, bowls, candle holders, lamps, any kind of statues and etc… The alabaster patterns look truly amazing for two particular reasons. The first one is – alabaster stone could be mined in variety of different colours (beige, brown, ivory, grey, green, even pink). The second one is – this particular stone could be turned to a very thin, transparent piece of art. I watched a demonstration when a lit candle was placed at the bottom of a pink alabaster vase. The vase shape became so transparent, that the light went through and the pottery was shiny as a lamp. It was a fantastic experience to observe that transformation and to eyewitness how the stone could become tiny and gauzy as paper. The visitor usually gets tempted to buy some master pieces inside. The owners and the guides claim all those figures and pottery keep being made in an ancient handy method. Could be partially true, but when you see a coffee cup set or tobacco pipes, created by alabaster, I am sure you would doubt it if the ancient Egyptians knew and used such type of stuff. The price was in Egyptian pounds and was already doubled and tripled for the tourists, so do not forget to negotiate it. If you don’t know how, go back to my article about the core skills, developed by travels and just remember the essence. I should admit, I was drenched in Karnak’s magic. It’s not just about the capacity and the size of the architecture. Also not about the epic stories, told by the guides. There is something in Karnak which can’t be easily explained. Something unique and timeless. The feeling when you step on this ancient ground, walking between the gigantic columns and trying to picture beyond the visible. 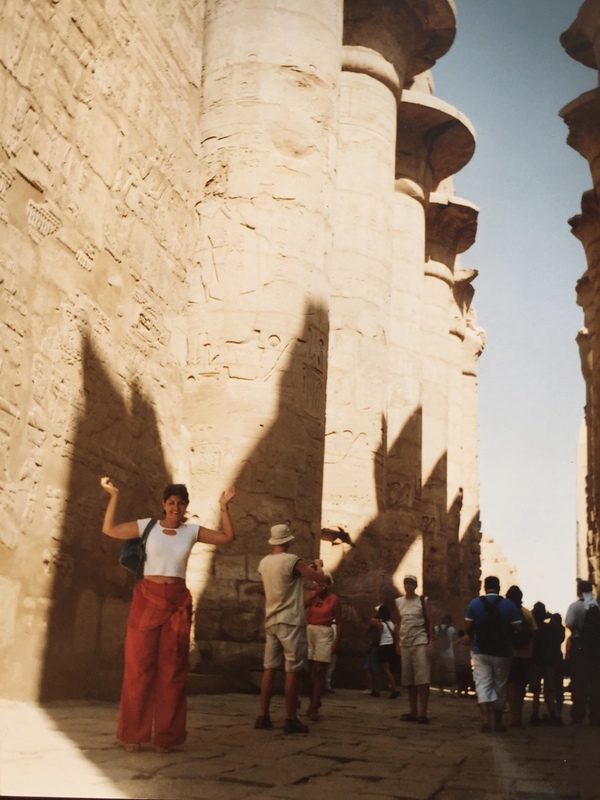 What I am curtain is – Karnak, Egypt for me is definitely a tale as old as time.